I've just had a builder in to quote for banging a hole in the wall, so it's all beginning to feel real! Can't wait to get started properly though; a couple of weeks yet! The ladder is just about where the door through to Studio 48 will be! This will be the Gallery area, with my stockroom behind the wall. 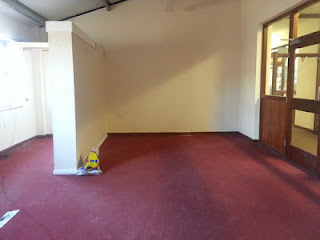 We are planning to move the shop into this area once it's been painted so that we can block off Studio 49 temporarily and minimise the dust. 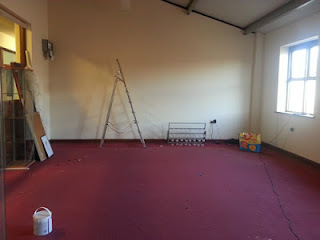 The shop will then move into Studio 49 once all the painting and decorating has been done. I was going to keep the red carpet, but now I'm not so sure; I'd much prefer it blue or purple! What do you think?